I admit it, one of the reasons I like Facebook is that I like to keep up with friends' everyday lives. I like reading about your kids, your hobbies, your days and even your errands. It's like sitting down with a cup of tea (or a Diet Coke) and catching up on your life...abbreviated form. (A huge blessing for a continually moving Air Force family who hasn't seen many of you in years!) I also find it a privilege to pray for you when you request it. I must admit I have not always thought of it as a privilege to pray for someone. Let's face it, there are many needs out there and our list can grow long by the end of the day and overwhelm us. It is a hurting world out there filled with hurting people. But as the Lord draws me closer to Him each day, I have begun to see prayer as a privilege. A way to bless so many who have blessed me. Allow me to tell you about a situation that also helped change my prospective on prayer. The short version...we lost friends a few years ago because they said we were too 'needy'. Too hard to be friends with. We met them during the last six months of bringing CJ home so yes, we were needy...and desperate, and tired, and hurting. (can you even imagine how they would have felt if they had known us the whole time? ;) Don't answer that!) And so they walked out of our lives. It hurt! And it made me question my asking friends for prayer daily. Understand, I fully believe in going to the Lord FIRST with prayer, but I also find comfort in knowing there are people out there pleading to the Lord in our behalf, but I wondered if we did that too much. About that same time Amy Grant's song Better Than a Hallelujah came out. I love what it says, "We pour out our miseries, God just hears a melody. Beautiful the mess we are, the honest cries of breaking hearts...are better than a Hallelujah." Every time I hear that song it is painful. I mean, it hurts my heart! But sometimes pain is good. Sometimes it shows us a problem. In this case it reminds me that while we can tire people with our prayer requests, shame on our human sinful nature, we can never tire the Lord. He longs to hear from us. Our hurts, our fears, our frustrations,...our everything! I tell you this story not so you can be angry with those people or feel sorry for us, but so that we can all reflect on whether or not WE have been those people at some time. Have we been too busy to lift our friends in prayer? Have we put our needs before others? Are we missing out on our friends celebrations because we are not willing to walk through the dark times with them as well? I can honestly say yes, that has been me before. And it grieves me. I now purpose to pray when asked. Immediately! (don't you love those people who when you ask them to pray bow their heads and immediately lift their voices to God?) And I consider it a priviledge! When I see a prayer request on Facebook now, I type what's on my heart to that person, close my eyes, and pray...THEN hit send! I have found that if I wait until the end of the day or during our nightly devotions I often forget (hey, I am a busy, often distracted mom!). But if I pray NOW, I am honoring my word, you, and the Lord. You are not forgotten by me! I desire to walk with you through the light as well the darkness in your life! So this morning I challenge you to join me and the next time you type the words "I will pray for you" DO...before you hit send! If you are like me you often open the fridge and stare. And stare some more. Give up, close the fridge and call for take out. 1- Supper's On The Table, Come Home by Rachel Masters. (You can find it here: www.schallertel.net/~rmasters) I LOVE THIS COOKBOOK! So much so, that I have given copies to a few young ladies in my life already. It gives 13 weeks of simple meals with not only the shopping list for each week, but also a time chart of when to start each step. My kind of simple. 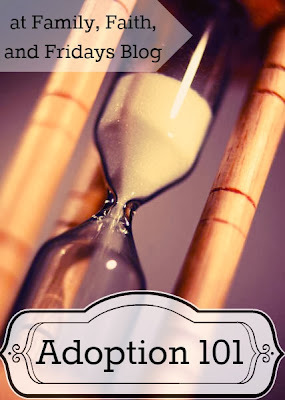 Plus, a great way to teach our future homemakers in training time management in the kitchen. Again, some of the recipes are very simple, but those are the ones my family liked best. I promise! 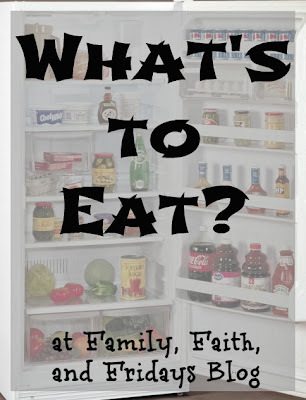 The kids loved it because it also includes one special snack eack week as well as one dessert...which often became a homeschool cooking project and our Friday Family Night dessert. 2- My own version of Supper's On The Table. Not nearly as nice as Rachel's, but yep, I did my own version using all of my favorite recipes. Now on my to do list: laminate copies for each of my children. 3- Phone a friend! Seriously. I have been known to call someone, you know who you are, and ask what you are fixing...and then follow suit. Hey, I am not picky! 4- EMeals. This one is new for me, currently doing it now, but I love how it combines recipes plus low cost items/sales with a store of your choice. I promise to post soon on how I cut our grocery budget in half soon, but for now, this is one simple way to get started. So, how about you...what's cooking at your house today? Do share on the blog please, it just might be tomorrow's meal! To say HAPPY HOME DAY to our sweet CJ! Three years ago today, CP and I stepped off a plane from Guatemala to Houston and our sweet son became a US citizen! 17 months it took us to get that boy home, but it was so worth every minute of the wait! Everyday he blesses us and his three older siblings with his smile, laughter and even silliness. Adoption is not for everyone, but I encourage you to make a difference in the life of an orphan, overseas or in the US in some way! (ask me how you can sponsor a child in Guatemala through Mayan Families) You WILL be blessed! We thank God for His work in our lives and for our many friends who loved and supported us along the way! We could not have done it without you all! Our family question of the week was if you could only pick 5 movies we own to keep, which five would they be? I have long since stopped recommending movies to other families. Just too risky! Either our conservative family favorites will bore you to death or send you into a fit of giggles, or maybe, just maybe you would shake your head in concern, being even more conservative than us. (it could happen!) 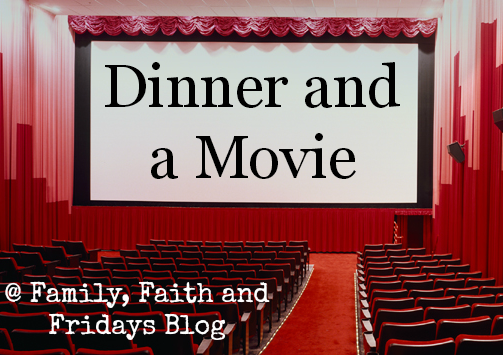 Too often in the past I have seen a movie recommended by a well intentioned family only to find that their convictions were just different from ours. Because of that, we have seen some movies I just wish we had not. I know we are sticks in the mud concerning profanity, but really! Is that a must!? There are more than a few good movies out there I would love for the kids to see....but the language...no thanks! I know, before you even say it...they will hear those words somewhere else. Yes, but NOT in my house and NOT by my choice. As my oldest has said before, once those words have entered your ears, head and eventually your heart they are hard to delete from your brain. At the very worst, you begin to see them as not a big deal anymore. While all the movies we watch may not by definition glorify the Lord (Cars, Finding Nemo, Christy, to name a few ;) I pray that by our choices, we are! So, for now, we tend to stick to classics, old series (be careful, we tend to have long term memory loss about what we watched as kids), and movies previewed by mom and dad. Stuffy...maybe. Safe...yep! I will admit, it used to be a harder call, but now, not at all. God is good about convicting us slowly sometimes so we can wrap our brains and hearts around His desires for our families. Oh, and one last thing, we eat around the coffee table often on Friday nights while we watch our movie. (poor CJ gets to watch about 30 minutes before we cheer, turn it off, do devotions and put him bed. Won't he be surprised one day to see how long movies really are?!). Two of our favorite easy family movie night meals are breakfast burritos and nachos. No recipes, surely you can make those! What do you eat for a fun family meal? And what 5 movies did you pick to keep? I have been chosen to be an independent product reviewer for The Old Schoolhouse Magazine. Each month I will receive educational books and other products to use and then give an honest review of from numerous vendors. Keep in mind that even if you do not homeschool, many of us are looking for quality educational products to use with our kiddos, whether for a supplement to what they are already doing or just plain 'ole fun! (my kiddos are excited about the plain 'ole fun part!) Each post will include all of the details of the products, my thoughts and experiences using them and even links to other reviewers' posts! Look for my first review post in March! Why the excitement? I love homeschooling. Not everyday, mind you, but most. I love box day, when all of the books come in and my kids act like it is Christmas all over again. I love the smell of those new books. I know, weird, huh? I love snuggling on the couch (or chair, or floor) and having a brand new reader read me their first book. I love the look of satisfaction on my kiddos' faces when they finally "get" something. I love seeing the kids leaned over something, working together! I love that my kids are best friends! I love that as I get ready to send my oldest off to college this fall, I can rest in the knowledge that she has been taught well , and will do great! Plus, I have tons to sweet memories of each day to sustain me! I love that we can talk about God throughout our day without fear of reprimand from anyone. I love that each day I spend with my kiddos brings us closer to each other and closer to the Lord! If you are interested in this crazy thing called homeschooling...ask me! I would love to share with you my heart and help you get started. And if you just think we are plain crazy...well, then thank you for loving us anyway! Thank you so much for becoming a follower of this blog...it no doubt helped me secure this position and I am extremely thankful for each one of you and to The Old Schoolhouse Crew for allowing me to join them. To just dive right in because I know you will ask...I had a good weekend...at home. Nope, did not go to Colorado with CP. Long story, but the details of life just added up and it did not work out. A reminder that sometimes our best laid plans just do not work out. Hmmm, maybe because they were not the best laid plans, or maybe because God just had other plans. Either way, no negative comments please, feeling bad enough without them...I am a words of affirmation gal, remember! ;) Regardless, I did get some rest, which I obviously needed! My mom (did I mention she is wonderful?) has cooked and taken care of the kids for me while I had a stay-cation! Long baths, good food, reading, quiet time with kids, decluttering (more on that to come soon) and sleeping in. Since Mom is unavailable I've hijacked the blog I'm going to do a guest post for dessert. I've decided to keep with the chocolate theme this Friday. Coat inside of a mug with nonstick cooking spray. Mix all ingredients until smooth. Add chocolate chips of nuts if desired. Microwave for 1 minute. Friday I am stepping onto a plane for the first time in 2 1/2 years. Did I mention I h*te flying? (we are not allowed to say that word in our house;) Did I mention flying terrifies me? Did I mention I have tried several times to look for a reason not to go? And yet, Friday it is. You see, my beloved goes to Colorado the same weekend every year to ski and fellowship with fellow military friends. I have gone with him on occasion...when driving was an option. He finally stopped asking me to go out of frustration I think...until this year. I got invited! 3 nights without kiddos, dogs, cooking, cleaning, appointments...well, you know, real life stuff. So while my marvelous mom (thanks Mom!) holds down the fort, I am going on a second honeymoon. shhhhh...don't tell the fifty-some people we will be there with that this is my plan. So I am going to rest, (nope, no skiing) just a time of quiet and relaxation with my hubby! (after the plane ride, that is) I hope to come back ready to be a better mom, better wife, better teacher, better housewife, better friend. Rested and relaxed. I will let you know! Did I mention I h*te flying? Will you please pray for me?? I passionately love my kiddos. Bet 'cha knew that! But here's the thing I have been pondering...do they know that? You see, when you have four kiddos, or two or three or up for that matter, God in His humor makes them all very different...just to keep you on your toes! So each of my four sees mom and dad's love a little differently. My firstborn...she is a physical touch gal...hug her, she's happy! My second...she is a gift gal...enough said! My third...he's a little harder to figure out, but gifts and time seem to work for now. The four year old...TIME! Play with me, are you going to play with me, who's going to play with me...you get the idea! See what I mean...it is enough to make a momma's head spin some days! Most days! And it is easy to smile and send them on their way while I get caught up in the business of the day. So today I am challenged to purposely spend time with each of them, speaking their language in some small way...which will be big to them. I can tell them I love them often, but I want them to KNOW it, to feel it to the very center of their core. Kind of sounds like the Lord...He loves us, but do we know it...to the very center of our core? Do we make time for Him as He gives us His touch, gifts, time and yes, even blesses us with playtime in our lives? Let me assure you...He longs to lavish us with all those things and more! 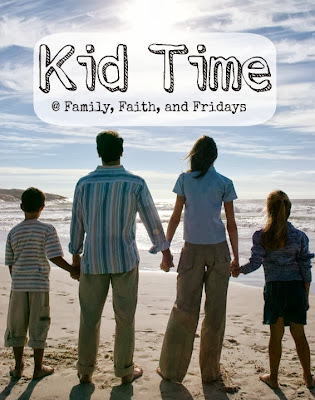 John 3:16 "for God so LOVED the world..."
So inspire me...leave a note on this blog and tell me... how do you plan to love your children today? I really want to know! Blend dry ingredients, cut in shortening and store in freezer in 2 1/2 cup measurements. Mix it all together, bake at 350 for 30 minutes in greased 8x8. We write the measurements of the eggs, water and vanilla on the outside of each baggie so it is super easy to mix up without looking for the recipe. Hey, when you are in the mood for chocolate who has time to find a recipe? Just saying! Enjoy and Happy Family Friday! 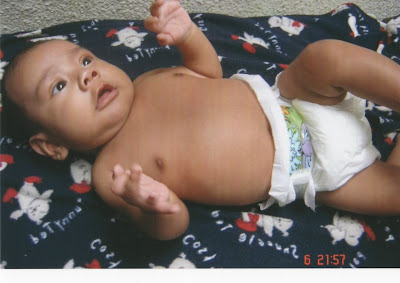 How amazing is it that today I had planned on doing a quick post on our adoption and woke up to see a video link on my FB page of CJ when he was still living in Guatemala! How it brought back so many emotions! (yes, insert...tears) A bilingual friend of ours, bilingual thank goodness because some of you all have heard my pitiful attempts at Spanish, lived across the street from where CJ lived, had a son about the same age, happened to take video with him in it occasionally, and then later blessed us by sharing those videos on youtube so we could see glimpses of what we had missed. Does it make up for 21 months of lost time, nope, but boy did it bless us beyond words! Did you notice the 21 months part? Yep, 17 months it took to get that kiddo home in addition to the 4 months before we got his referral. I could have almost birthed TWO kids by then! 17 months of a lot of whining, crying, stalking email, whining, crying, praying and did I mention whining? Just ask a few of my closest friends...never mind, don't ask them...it was a pitiful 17 months and I am blessed that most of them still even like me! Adoption is hard folks! No matter how your scenario shakes out. But, oh, how our lives have been blessed by the Lord. See where this is going? I had a lot of great ideas...really, they seemed fine to me, BUT God had another plan, and in hindsight I know that it was a better plan! But first I had to let go of my ideas, wants and selfish desires and let the Lord work. And he did, His timing not mine! Doesn't He do that everyday, if we just let Him. So friends, as we struggle each day with our hopes and desires, let us gently remind each other..His timing, not ours! I can now look into the beautiful brown eyes of our youngest and say God's timing is perfect! Yep, that was almost the title of this blog. It got CP's vote. It goes without saying, he got outvoted...but he does get points for being creative. (He gets points for lots of things actually, but that is definitely a blog for another day!) The 4 is for our four year old all the way to 17, our oldest! Now, THAT is a lot of years of school, with many more still to go as my olders like to remind me. Do you know how early school kids, and by default, their parents, get up!? Seriously folks! That is one of the main reasons I started homeschooling. I do not do alarms and early mornings well. (don't judge me yet) My kiddos would have never gotten to school on time. The last words poor A heard from my lips every morning when trying to get her to preschool on time was, "Hurry up, we are going to be late!". I cringed thinking those could be the last words she heard from me if the Lord chose to take me home on the drive back home. Wow, fast forward to now, 14 years later. Put AMAZING moms in my life that encouraged me, mentored me and loved me through the learning process. Blessed me with children who really want to be home with their mom and are very forgiving when she messes up! Put in our path wonderfully written curriculum designed to make my job easy! Met me on my knees more than several time when I was discouraged, tired or or had that lonely, homeschool mom feeling and assured me that He was the ultimate teacher. I am just along for the ride. Always worth it? YOU BET! We live together and school together. Learning as we go. Do I think homeschooling is for everyone? Nope! But I do know that it is for my family! And I thank the Lord for the privilege to a part of that journey everyday! One is off to college in six short months. I will accept that as a small sign of success. Homeschool mom or not, enjoy your journey! We still do a lighter load of school on most Fridays and it is still a day we look forward to, though now just as the 6 of us. The name has even changed to Family Night since, according to the kiddos, I ruined Fun Fridays for them. We usually gather in the living room for a "fun" dinner...getting the theme here? and then watch a family movie. (a post to come on that subject some day!) Sometimes friends or family join us, but most of the time it is just us, reconnecting after a busy week, doing devotions and enjoying the quiet time together....making memories. So tell me, what fun has your family had together lately? Psalm 133:1 How good and pleasant it is when God's people live together in unity! 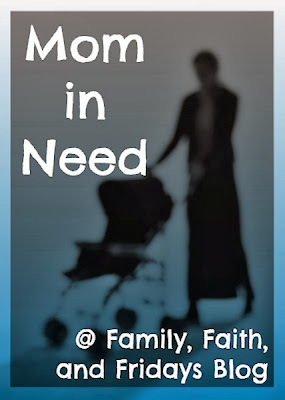 A mom in need...are you one? I know I am and I know I see many along my journey each day. And yesterday, I almost missed a God moment to help a fellow mom in need. Shame on me! Picture this, and I know you can because we have ALL been there. Poor mom in the local grocery store parking lot at the end of the day just trying to get home while her, I would guess, about four year old decides now, yes now,would be a great time to have a meltdown. Did I mention she was trying to push one of those silly carts with the car attached to the front? (don't you know a mom DID NOT design those things!) So while he screamed, kicked and cried and she, bless her, was trying to speak calmly and be the good mom we all desire to be, and I knew, just knew, that she could be stuck in that parking lot until the next morning. And I walked by her. Loaded my car. Got in my car and started it up. Shame on me. My heart was racing and God's little voice kept saying "do something". Can I just admit that the Lord probably says that several times a day to me and 9 out of 10 times I think of the right answer and then CHOOSE not to do it? Today was the 10th time. Yea God! Yep, I turned off the car, walked over to her and asked her where I could push her cart for her. She looked at me with disbelief and said, "Really? You do not know how much that means to me!" Oh yes, mom in need, I do! All of us do, right!? Because we moms in need have all experienced those moments where we just needed a helping hand, a smile or a kind word . Because many of us have or had four year olds. Because some days are just easier than others. And because we have seen people look at us with THAT look and choose to walk away without helping. We have been those people as well. Shame on us! And so today I challenge you to be on the lookout for a mom in need. Life is difficult and we need to stick together! Plus, it pleases the Lord. Works for me...yea GOD!